All plants require certain chemical elements for proper growth and appearance. Of these nutrients at least 16 are known to be essential elements. If limited nutrients are available in the soil, lawn growth and quality may be limited. However, essential elements can be added to the soil through fertilizer applications. Trees and shrubs are living investments that grow in value with each passing year. When properly selected and planted, trees and shrubs can be expected to thrive with the right care, which may include watering, fertilizing and pruning. Just as certain established drought-tolerant plants may not require water during dry spells, mature trees and shrubs growing in favorable soil conditions may require little or no fertilizer. All pruning will be done to preserve the natural growth of the shrubs and trees in accord with the normal characteristics for each species. Shrubs such as Pampass grass and Border grass will be cut back in late winter, accompanied by the removal of decayed matter. Non-flowering Evergreens will require two prunings a year. Shrubs such as Oleander and Eleagnus will be pruned as needed for containment purposes. Palm fronds will be cut off when brown or yellowing occurs. Homeowners often overlook problems associated with soil compaction. Insects, diseases, nematodes, improper watering and a lack of fertilizer are often blamed for a lawns decline when the real culprit is compaction. The problem starts when the top 4 inches of the soil become compressed, impeding the movement of air, water and nutrients to the grass roots. This stresses the grass plants, making them less able to compete with weeds and slow to recuperate from injury. In time a compacted lawn needs renovation. Fire ants are a problem because their sting can cause medical problems, they harm wildlife, and interfere with outdoor activities. The mounds are unsightly and cause problems with land use. Chinch bugs are a major problem, mainly with St. Augustine lawns from July through mid September. 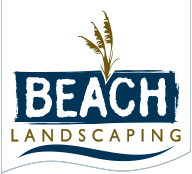 For homeowners with outdoor pets, Beach Landscaping can take care of unwanted fleas and ticks.